When Tasty met Tech at UKRC! 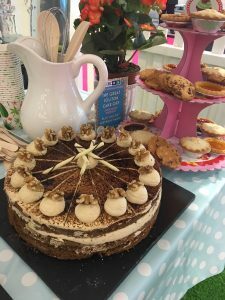 You are here: Home / News / When Tasty met Tech at the #NHS70 celebration! Back by popular demand, The Great Soliton Cake Off returned for the second year to UKRC. Over 430 delegates visited the stand to sample cake, discuss their radiology IT requirements and network with the Soliton IT Product, Sales and Technical teams. Brian and Bob demo’d non-stop to the huge group of NHS Trusts who are looking to swap-out their old RIS software with renewed, flexible and innovative systems. 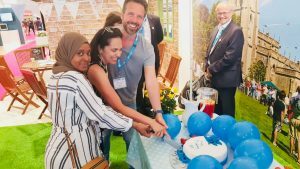 This year, we toasted the achievements and future of our internationally renowned health service at the #NHS70 birthday party on Tuesday afternoon. Soliton IT users from Royal Bournemouth & Christchurch Hospitals and Imperial Healthcare joined us to cut the cake in honour of 70years of NHS. The fun didn’t stop there! On Tuesday evening, the Siemens Healthineers-sponsored AXREM dinner hosted the Rick Parfait Jnr Band to our 16 NHS and Radiology network guests. Team Soliton IT danced the night away in St George’s Hall, rejoicing in the elevated atmosphere of the successful show and, of course, the World Cup England win. With huge interested generated at the stand for our RIS and Radiology IT applications, ample cake sampled, 2 evenings of dancing into the night and a token fractured ankle for our Marketing Manager, we thank our customers, contacts and the Radiology community for giving us another wonderful UKRC. Thanks to all who visited us and supported us in 2018. And the cake? A clear winner for the Great Soliton Cake Off 2018 was the Mojito cake – a heavenly combination of buttercream, lime and mint. Thank you to event caterers Centerplate for their efforts. And the ankle? She blames the shoes. See you at UKRC 2019 10 – 12 June ACC, Liverpool.